History of Viking swords. Viking sword types. Viking weapons. Sword history. The Viking sword comes from the family of swords known as the spatha, the spatha measured on average 83 centimeters in length however the Viking sword itself was slightly longer at around 95 centimeters and weighed in at 2.5 lbs. The blade itself measured on average 74 centimeters in length. The Viking sword was in use until about AD 600 but swords believed to be derived from the Viking sword were in use until AD 1000. The name Viking sword is often misleading as the sword was not exclusively limited to Vikings as it appeared all over Europe during the Viking age. A Viking sword would most commonly be owned be a Jarl or Viking chief or wealthy Vikings. 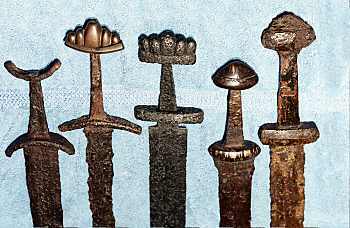 The great advantage the Viking sword had over its competitors was the fuller, the fuller was a rounded or beveled groove running down the length of the blade, the function of this fuller was to remove metal from the blade in order to make it lighter while not compromising its strength as it would allow the sword to bend but not break when it hit the bone. These fullers were also known as blood grooves. One of the main disadvantages of the Viking sword was its price hence the reason why only wealthy Vikings owned one, the less fortunate Vikings would carry axes or spears. 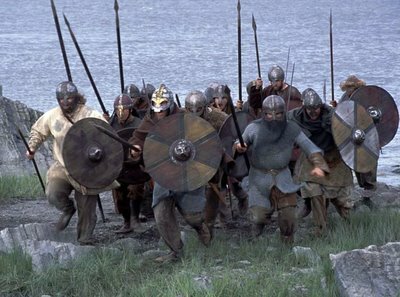 This lead to looting as destroying a European army would often result in allot of new weapons and swords which in turn inspired the Vikings into fighting more. This entry was posted in Swords and tagged Viking swords, Vikings. Bookmark the permalink.